Love Google Earth and have all your friends’ contact information in your Mac’s Address Book? Then you will like Earth Addresser! It takes the addresses from your Address Book, looks up their coordinates on the map and writes that information to a ‘KML’ file. 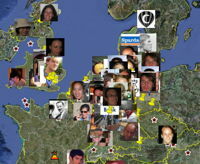 Google Earth can open that file to display your friends’ places right on the map. 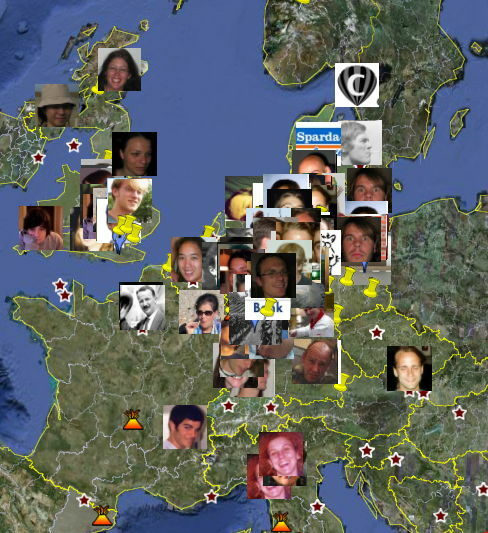 If you have added photos of your friends to their cards in Address Book, those photos will appear right on the globe instead of the usual drawing pin. Thanks to Ronald Leroux for the French localisation. Uses Apple’s CoreLocation for address look up instead of Google Maps. Uses Sparkle for automatic updating. Uses country-specific address formats provided by Apple’s Contacts. Make address lines to omit and labels for old data configurable in Preferences. Please note that the Earth Addresser v2 series stopped working as Google stopped supporting the use of its maps service for this purpose. 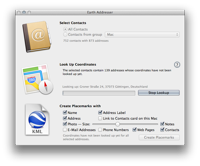 If you are using Mac OS X.8 or newer, please upgrade to Earth Addresser v3. Users with an older Mac OS X version need to downgrade to v1. Address Lookup and Placemark file creation can be cancelled on Mac OS X.5 and above. Support for Sudden Termination in Mac OS X.6 and above. Solves problem with images appearing too large when set to use the minimal size (Thanks to Steve Parker for pointing this out). Doesn’t create image files when they are not needed (Thanks to Steve Parker for pointing this out). Fixes failure of address grouping in some situations (Thanks to Steve Parker for his help). Prevents application from being quit while performing lookups. Placemarks can be created without the address and label. Phone numbers, e-mail addresses and web pages labelled “old” are not included in placemarks. New option to group addresses by label. New option to hide addresses labelled “Old” or “Alt” or “Ancienne” by default. New command to repeat look-ups which failed previously. Improves address look-up progress display. Fixes tab order in the main window. Fixes capitalisation of strings in English interface. Uses own ‘home’ und ‘work’ icons for contacts without a photo. Adapted icon to match Google Earth 5’s. Improved handling of a lack of internet connection. Resolves the excessive memory consumption when processing large address books. Thanks to Steve Parker for pointing out the problem. Improved localisation of PayPal Links. Addresses are now looked up – and cached – by Earth Addresser. More options for what is written in the KML file. Info bubbles appearing in Google Earth now contain photos. Improved clickability of links to Address Book records in Google Earth. A list of addresses which could not be located can be displayed. Added English localisation for new user interface.